Tall Pine Trees Beyond the Pond – Agnes' Sanctuary. A journey to inspire. Half-hour to lunchtime, and here I am. 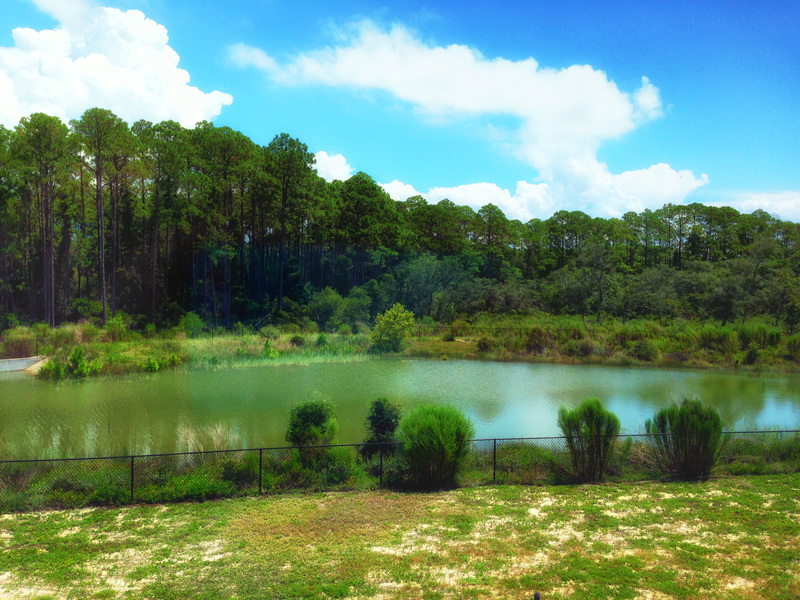 Standing by the window of my study, looking at the man-made fenced pond where two gators live, and at tall pine trees and the forest behind it. I saw a deer once, and a bear. Walking slowly and steadily, stopping at times, looking for food. Maybe they were enjoying the sun, as they gazed up beyond the shadow of pine trees. 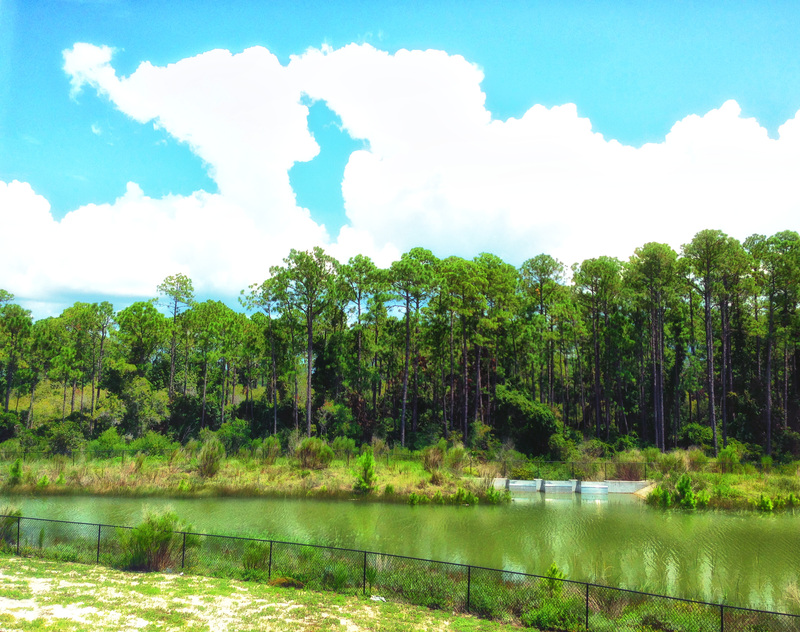 I see nothing today, but the same tall pine trees beyond the fenced pond. The pond looks green today. It was blue early in the morning, when the sun just rose from the east and its light glistened above the pond. There is always wind in this humid territory, blowing the shrubs left and right. The land surrounding the pond is not of soil. At least not in my side of the pond, it is sand. White sands with patches of green grass and short shrubs, trimmed once a week by that same maintenance guy. Among the sands, grass and shrubs, I see yellow flowers. Small yellow flowers, which appears to be part of the shrubs and it has a name: African bush-daisy. I see that it grows inside the fence of the pond amongst well-grown shrubs and bushes, no one to cut it. My gaze went further adrift as my mind wonders. My eyes fixated beyond tall pine trees and into the forest. Longing to see the deer one more time. Wondering how they can get through the dense, tall and thick shrubs and bushes among pine trees. Wondering where they sleep. Wondering the land beyond this man-made pond. Is it sand? Maybe we can no longer see the sand as every inch was filled by greens. I closed my eyes. Imagining breathing the air outside, hearing the sound of the birds and bugs, the wind blowing south. I opened my eyes. Nothing changed; the tall pine trees and the shrubs are still there. I closed my eyes one more time and took a deep breath. Transporting myself across the pond. Alone. Barefoot. Just before the forest, right by the fence across on the shrubs. Under the sun. Imagining my barefoot on the ground. Still with my eyes closed, sensing with my feet whether it would be sand or soil beneath me. Lifting my right foot, stepping it forward. I feel the green grass tickling my naked foot. Then it no longer matters, be it sand or soil. The grasses live happily here, beyond the pond. With the wind caressing their very strand, waiting for tiny drops of rain to fulfill their thirst under the sun. I took a deep breath one more time, and smell the green grass that was ever so fragrant.